Try a soft yolk over home fries or a crispy fried egg on a veggie rice bowl, says Aoife McElwain. A WISE COOK knows the culinary power that lies in a box of eggs. A myriad of meals appropriate for morning, noon and night can be concocted from this one kitchen staple. On those evenings when you find yourself in your kitchen feeling utterly uninspired and too exhausted to cope with fuss… put an egg on it. Eggs are so gloriously versatile that they can be the starting point for anything from an American diner breakfast-for-dinner vibe to a more refined Japanese-inspired supper. 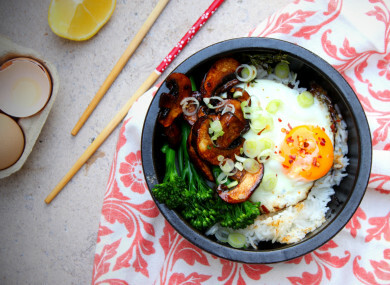 Try a soft yolk over home fries, or a crispy fried soy sauce egg on top of a veg-loaded rice bowl. Here are a couple of ultra-simple recipes to try when you’re short on time, ingredients and motivation. Leave out the chorizo if you’re feeding vegetarians, and add a dash of your favourite hot sauce to bring a smoky spiciness to your supper. 1. Heat about three tablespoons of oil in a large non-stick frying pan over a medium heat. 2. Add the peeled and cubed potato pieces to the oil. Let them fry over a medium heat for 15 minutes without moving them. It’s very tempting to move them around and check if they’re burning but leaving them to sizzle away will help them take on a lovely golden brown colour and crunch. You can keep an eye on them by turning over one of the potato cubes to make sure they’re not burning. 3. Give the potatoes a good shake in the pan and use a spatula to turn over all (or at least most) of the pieces so that you can get a nice even fry. 4. Add a little more oil if you think the pan is too dry, and fry for another fifteen minutes. You want the potatoes to be golden brown on the outside but soft and cooked through on the inside. 5. Once ready, season the potatoes generously with salt and pepper, and keep them warm. 6. In a second frying pan, heat a little bit of oil and add the chorizo pieces. Fry for about five minutes or until the chorizo is cooked. Remove with a slotted spoon and keep warm. 7. Crack your eggs into the same frying pan, letting them fry in the leftover chorizo oil. Fry until cooked to your liking. 8. Serve the fried eggs on top of the home fries. Add the cooked chorizo on top. Sprinkle with the crumbled feta and chopped parsley. Add a touch of salt and pepper if necessary and serve immediately. I use basmati rice for this recipe but feel free to try any sticky rice you like, or sushi rice for a more traditionally Japanese grain. If using sushi rice, follow the packet instructions for the cooking method. For basmati, follow my method below. 1. Place the rice into a saucepan. When boiling rice, you want double the amount of water than rice, so add two small coffee cups of water to the rice. Cover with a lid and bring to a gentle but steady boil. Allow to boil until the water has completely evaporated. This will take between ten and fifteen minutes. Turn off the heat and leave the lid on the rice until ready. 2. Meanwhile, heat the oil in a frying pan over a medium to high heat. Add the soy sauce, chilli flakes and thyme, and mix well with the oil. Add the mushrooms and fry for about ten minutes in the oil and soy sauce, until cooked. 3. As the mushrooms and rice are cooking away, boil some water in a small saucepan. Boil the tenderstem broccoli for three minutes and remove from the hot water. Place the them in a bowl of iced water so that they retain their lovely green colour. 4. Add the tenderstem broccoli and the garlic for the last two minutes of cooking the mushrooms, and then remove everything from the pan. Don’t clean the pan. 5. Add a little more oil to the same pan with the leftover soy sauce and crack the two eggs into the pan. Fry to your liking. 6. Divide the rice between two bowls. Top with the mushrooms, broccoli and a fried egg for each bowl. Finish with a sprinkling of finely chopped spring onion and a dollop of your favourite Sriracha-style hot sauce. Serve immediately. Email “Got eggs? You're halfway to dinner with these deadly 30-minute recipes”. Feedback on “Got eggs? You're halfway to dinner with these deadly 30-minute recipes”.